If you have questions not answered in the FAQ section below or if you need to order/return brackets, please call us at (800) 459-1892 or send us an email. Why such thin steel? Is this bracket strong enough? Although the Floating Surface Adjustable Bracket is just 3/16″ thick, it can provide far superior support than competitive options. The bracket’s patented adjustability creates upward force on the countertop for increased strength and reliability. This allows us to make the Floating Surface Adjustable Bracket from thinner steel for the lowest-profile countertop support available. Generally, you will need one bracket every 12-18″. The chart below gives bracket requirements for countertops of various widths. Please see the Installation Guide for more information on how the brackets should be spaced. 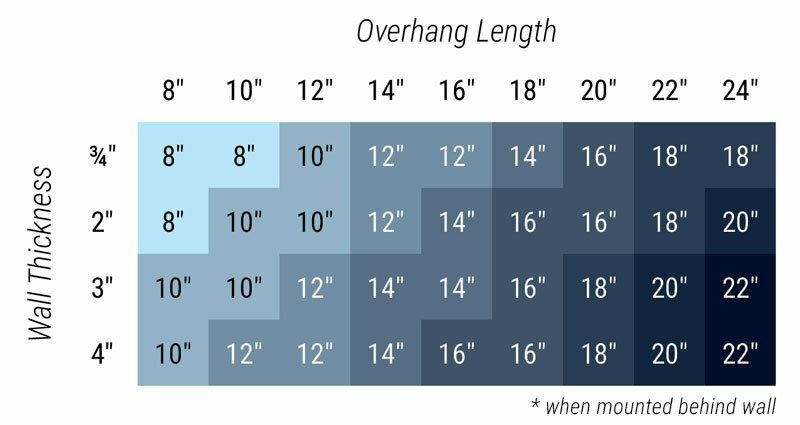 What size bracket do I need for my overhang? Our Floating Surface Adjustable Brackets support overhangs between 8” and 18”. See page 2 of our downloadable Installation Guide for a size chart or watch the video below. What does active support mean and what does it do for me? Active support means that the bracket is providing constant upward force on the underside of your countertop, giving you peace of mind that your countertop is properly supported. Is all the hardware included with the bracket? Yes, each bracket comes with (2) wood screws, (2) set screws & an allen key. Do these need to be installed by a professional? You can also check out our simple four-step installation overview or download the detailed installation guide for step-by-step instructions. Can I mount these to the outside of my cabinet / wall? No, these are designed to be installed inside your cabinets or wall. The adjustability feature only works when the bracket is installed behind the wall. If you’re looking for a bracket that can be mounted externally, check out our Victory Bracket. Which size bracket will I need? To determine the right bracket size, subtract 2″ from the depth of your shelf and select the closest bracket size. The Townley Shelf Bracket can support shelves up to 14″ deep. You’ll need one Townley Shelf Bracket for every 18″ of shelf length. The first and last brackets should be placed approximately 1″ from the ends of the shelf, and the remaining brackets should be spaced evenly. What tools/hardware are need for installation? Each Townley Shelf Bracket comes with the four wood screws necessary for mounting. You’ll need a drill, ⅛” drill bit, Phillips screw driver, and level for installation. Which size bracket do I need? When mounting the Victory Bracket behind the cabinet wall, the following chart can be used to determine the correct bracket size. When mounting the Victory Bracket externally, subtract 2″ from your overhang length and select the closest bracket size. Can I mount these to the outside of my cabinet wall? Yes, the Victory Bracket may be mounted either on the outside of the cabinet wall or on the inside for hidden support. The low-profile Victory Bracket is made from thinner steel than most other brackets on the market, but its unique ribbed design provides strength that exceeds that of bulkier, more expensive brackets. The 8″ to 16″ lengths are 3/16″ thick; the 18″ to 22″ lengths are 1/4″ thick. Do you offer custom brackets? Yes! Send us your custom bracket request at support@steeldesignsolutions.com. At Steel Design Solutions, we stand behind the quality of our brackets and hope you’re fully satisfied with your purchase. If you’re unsatisfied for any reason, please contact us within 30 days of delivery to request a refund. Visit our Return Policy page for more information. I purchased the wrong amount and/or size, what should I do? Please contact support@steeldesignsolutions.com and we would be happy to assist you in correcting your order.